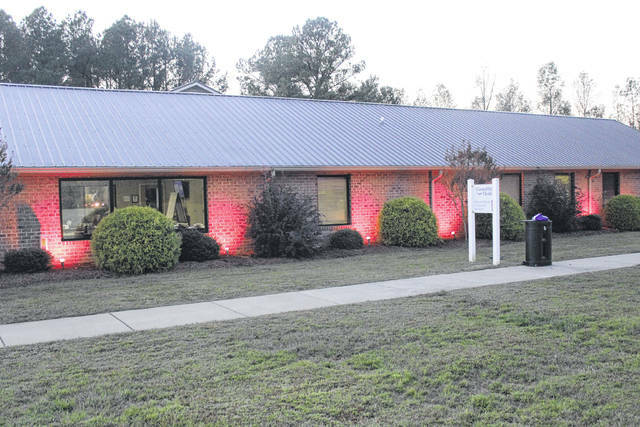 DUNN — In honor of those fighting breast cancer, beacons of hope stood outside the CommWell Health building and watched a wall illuminate with pink. “It is said the fruit of light is found in all that is good, all that is right, and all that is true,” Vann said. A patient, who wished to be unidentified, talked about her experience with the assistance of a Spanish language translator. She was a healthy person with three children and breastfed. After an annual checkup, a doctor did not detect anything, but she later scheduled a mammogram and a photograph was taken at UNC Rex Hospital in Raleigh. It showed signs of breast cancer. At that moment, she thought her life was over. But she was willing to do anything to survive, which meant having a double mastectomy. 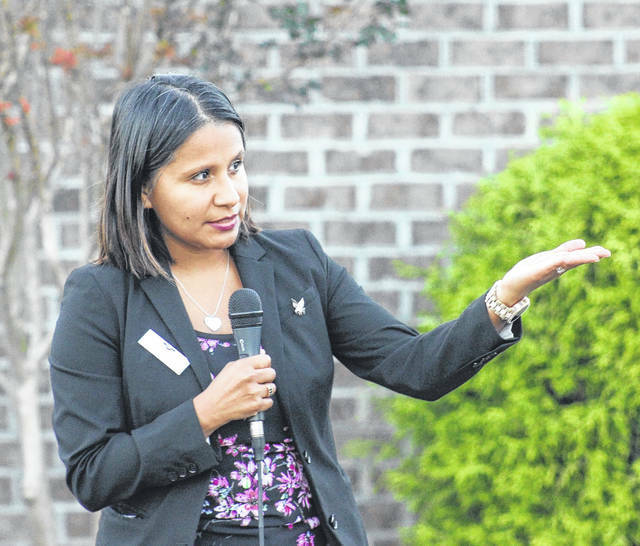 While speaking to the crowd, she encouraged everyone to not wait and find the cancer at early stages to prevent the challenges of progressive radiation and chemotherapy treatments. One of her biggest worries was her family and the financial situation, but she said a clinic like CommWell Health is a blessing because of its people. 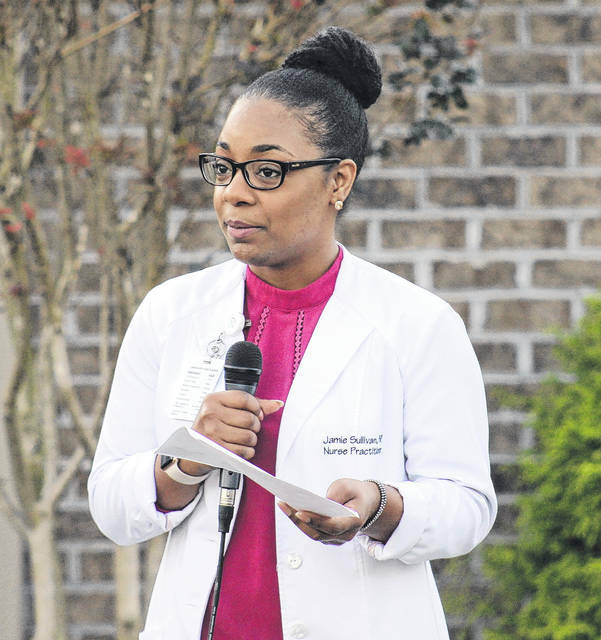 Andrea Morales-Williams, communications and marketing coordinator, said the testimony was important to show the importance of screening and prevention. Vann was also grateful that her story was shared. A moment of silence was shared before the lights were turned on to honor individuals fighting together. 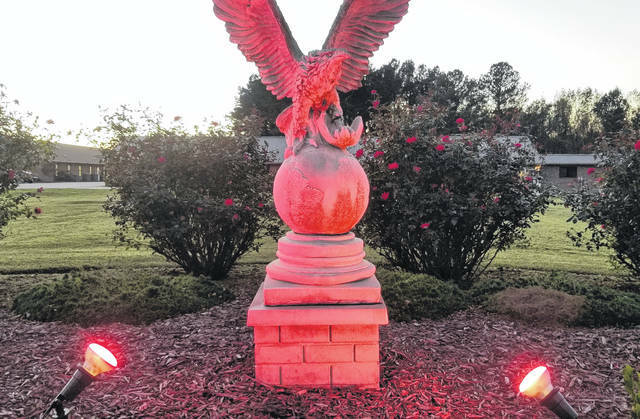 “For those woman of valor who have suffered from breast cancer, for those women who have gone before us and for those friends and families who were touched by these individuals with memories of courage, love, and life, may we have a moment of silence,” Vann said. Pam Tripp, CommWell Health’s CEO (Chief Encouragement Officer), provided a message of encouragement while spreading awareness on being proactive. Even with resources for mammography, Tripp said it does not meet the need. Although a mobile unit and partnership with UNC Rex Hospital in Raleigh is avaialble, the organization is still booked for months. The ceremony also featured participation from Tim Butler, chairman of CommWell’s Eagle Foundation. Butler gave a prayer of support for families, advancement of research and for community members to be proactive. 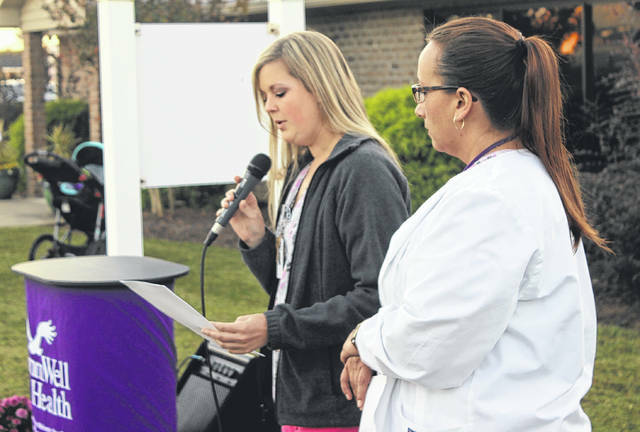 Registered nurses Janette Godwin and Hope Bass provided statistics about breast cancer, which is the most common cancer in women. One in eight women in the United Stated will be diagnosed and it’s estimated that more 252,000 women in the country will have breast cancer, with 40,500 dying from it. Although it’s rare, more than 2,000 men are effected as well. From that group, 460 will die. More than 3.3 million breast cancer survivors are alive in the U.S.
Jamie Sullivan, a family nurse practitioner, spoke about protection and risk factors for breast cancer. She suggest that women have mammograms and perform monthly self-exams at home for early detection. By the age of 35, women should have routine mammograms every year. Some of the risk factors are obesity, unsanitary lifestyles, alcohol consumption, and a poor diet. Like other officials, she hopes the millions of breast cancer survivors continue to rise. “It’s important to help our patients understand and identify these risk factors, but it’s even more important to help our patients understand the necessity of preventive measures to ensure early detection of breast cancer,” Sullivan said. 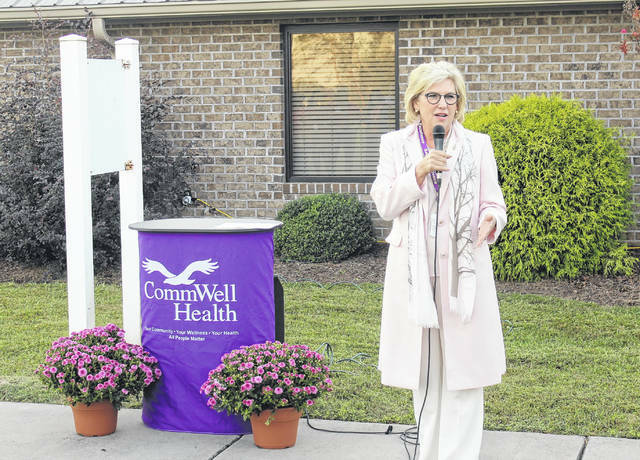 CommWell Health partners with UNC Rex Healthcare and The Susan G. Komen Foundation to provide on-site mobile mammography services to patients at the CommWell Health Newton Grove/Spivey’s Corner campus and the McGee’s Crossroads practice location. Individuals qualifying for financial assistance can receive free mammogram screenings and follow-up care on the mobile mammography unit. If you or someone you love are concerned about developing breast cancer schedule an appointment with CommWell Health by calling 1-877-WELL ALL (935-5255). Thanks to largely stable incidence rates, improved treatment, as well as earlier detection through screening and increased awareness, a woman’s risk of dying of breast cancer dropped 39 percent between the late 1980s and 2015, translating into more than 300,000 breast cancer deaths avoided during that time. Despite that progress, there’s much more to be done. Breast cancer is still the second-leading cause of cancer death in women, second only to lung cancer. There is still a large racial gap in mortality, with African-American women having higher death rates compared to whites, even as incidence rates are similar. • While black and white women get breast cancer at roughly the same rate, the mortality rate is 42% higher among black women than white women. • Numerous studies have confirmed that alcohol consumption increases the risk of breast cancer in women by about 7%-10% for each one drink of alcohol consumed per day on average. Women who have 2-3 alcoholic drinks per day have a 20 percent higher risk of breast cancer compared to non-drinkers. • Obesity increases the risk of postmenopausal breast cancer. Risk is about 1.5 times higher in overweight women and about 2 times higher in obese women than in lean women. • Limited but accumulating research indicates that smoking may slightly increase breast cancer risk, particularly long-term, heavy smoking and among women who start smoking before their first pregnancy.